This 3-day anti-inflammatory detox plan will make you feel amazing, even if you’ve been eating fast food like there’s no tomorrow for a while. Time for a little detox, my friend. If someone told me years, nay, even months ago I would ever be doing a detox, then I would’ve probably spit in their face. You do a detox, loser. And that spit would probably be toxic, as you will find out later. I never believed in detoxes, I have a liver, you know? And with a detox, what – I’m just gonna eat nothing and fart rainbows? Stop it. Until I realized that I needed a RESET and suddenly the word detox stopped sounding like brainwash from the 80ies. And started sounding really, really, really good. You can start this detox on Friday or do it during your work week. It’s your choice. I will be doing it over the weekend. This is a gentle detox and you will not be starving. You’ll feel light, won’t be overeating though. In case you feel hungry at some point and it’s not the time to eat yet, drink some water and then decide whether you need some food or not – then go for the snacks. You might experience some detox symptoms like headaches (especially if you drink coffee like me), it all depends on what your current dietary habits are. Two reasons for me to do this detox – What’s yours? Reason #1: I’m eating too many carbs. I realized I eat carbs almost exclusively lately and I’m worried about my little pancreas secreting too much insulin like it’s nada. I want to reset any insulin insensitivity I might have. My family history is all diabetes and cardiovascular diseases, so I want to prevent whatever I can, for as long as possible. Reason #2: I want to stop craving junk. I didn’t tell you this, because I’m secretive like Beyoncé & Jay Z, but about three months ago I went to McDonalds after about a year long hiatus. I felt like a miserable dog after that. But I got a pink glass, because I bought a menu. Okay, so that wasn’t that bad. Just one time, I’m only human, right? That’s what I thought the next day and then the day after that. Because I went to McDonalds 3 nights in a row (I told you, toxic). And got a glass every night. I stopped feeling miserable. I felt good. It helped me deal with the huge amount of stress I was going through at that time. Now, this detox is not to reverse the 3 nights I spent at McDonalds 3 months ago. A little too late for that, my liver. It’s to stop all the cravings I am having constantly right now. This 3-day detox plan will help you reset and make you feel brand new again. After the 3 days, the goal is to continue eating healthy no matter what else is going on. For this 3-day anti-inflammatory detox plan, make sure to eat a variety of the following foods every day and make vegetables a priority (around 80% of your food). These foods fight inflammation and provide your body with real energy and nutrients that have anti-aging and antioxidant properties. They’re shown to prevent various diseases and also improve bone and skin health, especially when combined together. Vitamin C: Vitamin C-rich foods like berries, kiwi, cabbage, lemons, oranges, parsley (well, most fruits and vegetables). Carotenoids: These are green and orange/red foods like tomatoes (sun-dried and tomato paste are also good), carrots, spinach, kale, arugula. Special Antioxidant and anti-inflammatory: These foods are powerful antioxidants and anti-inflammatory – a little bit goes a long way. We’re talking garlic, onions, herbs and spices like turmeric, cumin, chili powder, basil, parsley, ginger. Grains and legumes: To get a good combination of fiber and protein – chickpeas, lentils, quinoa & millet. Sweet Fruit: To add some more fiber and sweetness – banana (1/day) or mango. Water Water is my favorite food! Alright, I know it’s not a food, but it’s important to drink enough water while doing this 3-day detox. These recipes are just suggestions and what I have planned for this 3-day detox. We’re all different and what works for me, probably won’t work for everyone. If you have an intolerance to one of the ingredients, you’re welcome to choose another option or add your favorite detox recipes! As always – do what’s best for you. Special equipment: hand blender This recipe makes around 2 glasses. I would usually drink the second glass later when I need something small. This time, I will also add a tbsp of chia seeds and some cilantro to this recipe, other than that the recipe is here. Special equipment: hand blender All you need to do is blend it all together, put in a bowl and eat this smoothie bowl with a spoon. You’ll find the complete recipe here. Special equipment: not needed, a mixing bowl is enough All you need to do is – chop the vegetables and mix everything together. The original recipe calls for olives, but I think I might leave them out. Full instructions are here. Special equipment: not needed, a mixing bowl is enough Again, chop the vegetables and mix everything together. Feel free to add some onions, nuts, legumes or grains to make it more filling. Full instructions are here. Special equipment: not needed, a mixing bowl is enough The last time I made this recipe, it was more than enough for two servings. You can either prepare 1/2 the recipe or store the leftovers in an airtight container and eat them at your next lunch or dinner. In this case, remember to add vinegar, oil and tomatoes just before eating. You can find the instructions here. Special equipment: food processor This recipe also makes 2 servings and they store in the fridge for 2-3 days. Again, keep whatever you don’t eat in an airtight container and assemble lettuce wraps just before eating. It’s one of my favorite recipes – filling, healthy and very delicious. You’ll find the full recipe here. Special equipment: hand blender This recipe makes 4 bowls. Keep leftovers in an airtight container in the fridge and reheat before eating. Now for lunch, I will be having option #1 twice and then option #2, 3 & 4 for the other lunches/dinners. I included the soup here, in case you want to have a healthy detox warm option. To me, even though it’s cold right now, I’m craving cold food and SALADS, so I’ll stick with the first three options. Keep at least 3 hours between meals and the last meal for the day to be at least 3 hours before bed. So if you’re going to sleep at 11pm, the latest to be 8pm. I wouldn’t go and do anything too intense on this detox, but some yoga and pilates will be a great here. To relax, strengthen and really reconnect with the body. Alright! I’m very excited about this detox, I really need it. I’ll actually stop drinking coffee for a few days, which hasn’t happened, since like…well, I don’t know..I wanna say a year?? 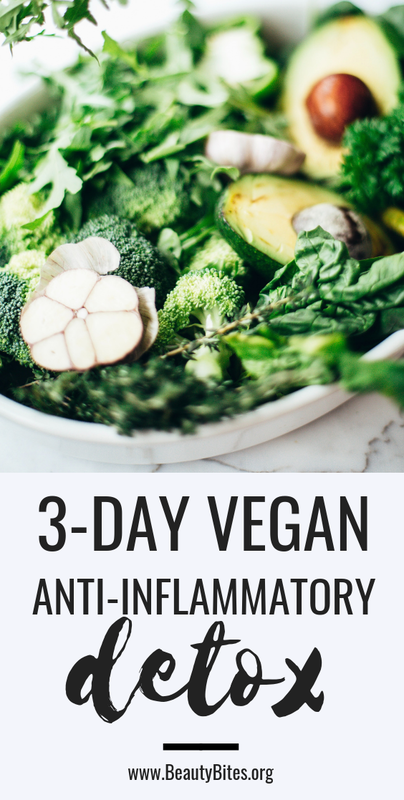 I hope you enjoy this gentle 3-day anti-inflammatory detox plan, if you do and want to do it together with someone, make sure to share this post with your special detox partner and subscribe below via email to get more updates, healthy tips and recipes from me! Hope you have a great week!